Tammy Baldwin may be the first openly gay U.S. senator and no one considers it an issue worth talking about it. 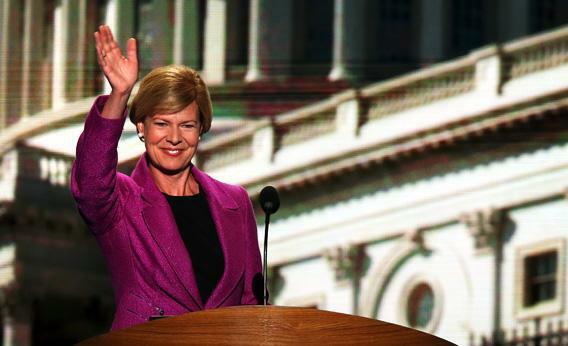 Tammy Baldwin may become the first openly gay U.S. senator. And no one is talking about it. MADISON, Wis.—Tammy Baldwin is 16 minutes early. The campaign office is already almost full of people who want to meet their candidate for U.S. Senate. Thirty-odd student volunteers, most of them from the University of Wisconsin, sit in chairs and against the walls, decorated by handmade charts that show how many doors they’ve knocked on, by 8 x 11 print-outs of Joe Biden quotes, by a whiteboard decorated with the Obama “O” logo and an inspirational message. SMILE! You work for the President + Tammy! Baldwin has represented this college town in Congress for 14 years, coming there from the state Assembly, coming to the Assembly from the Dane County Board of Supervisors. The locals swear that Baldwin has a photographic memory for voters. I introduce myself. “We met in the student organizing center during the Capitol protests!” she says. “I remember it vividly.” She’s right. I’m inclined to believe the locals. It’s three weeks before the election and Baldwin’s narrowly winning a race she was supposed to lose. The Wisconsin seat is being vacated by Democrat Herb Kohl, an elfin retail-store tycoon who funded his own campaigns with the slogan “Nobody’s Senator but Yours.” (Republicans liked to shorten that to “Nobody’s Senator.”) The Republican candidate is Tommy Thompson, who won his first election in 1966, and won a fourth and final term as governor in 1998 by a 21-point landslide before becoming George W. Bush’s secretary of Health and Human Services. Six months ago, most projections of a GOP Senate takeover assumed that Thompson would defeat the liberal congresswoman from Madison. Thompson is 70 years old and looks it, and has adapted to the YouTube/Twitter era of campaigns with all the grace of Bobby Knight after a foul call. Baldwin is a natural. She’s also a lesbian. And nobody in Wisconsin thinks that’s hurt her. Scott Walker’s state may elect the first openly gay senator in American history, and it’s a total nonissue. It might even be helping Baldwin. In my long weekend canvass of Wisconsin, I utterly failed to find any voters who factored Baldwin’s sexual preference into their votes. In a state that gave a 59 percent “yes” vote to a 2006 gay marriage ban, there’s no palpable backlash against a well-known gay candidate. Democrats, generally, were happy to answer the question but wondered why it was being asked. Republicans simply didn’t know why it might matter. “The person she’s hoping to replace is also of the same persuasion,” says Joyce Smith, a Thompson voter and volunteer in Racine. “I don’t think that matters.” Although it has often been rumored, Sen. Kohl has never claimed to be gay. He even voted for the Defense of Marriage Act. Baldwin’s been out for her entire political career. In 1998, the year Baldwin won her House seat, the openly gay Marc Pocan ran for her Assembly seat. At the time, a Republican candidate for Assembly cut a radio ad attacking another Democrat for being endorsed by Pocan—warning that “gays from Madison” would be “knocking on the doors” of upstanding citizens. Those ads don’t get made here anymore. Today, Pocan is running for Baldwin’s House seat and winning it easily. (The redistricted WI-02 gave 69 percent of the vote to Obama-Biden in 2008.) It will probably become the first seat to be represented by two gay members in a row. Between the election and his swearing in, Pocan will celebrate his sixth wedding anniversary. We meet up at Fair Trade Coffee, near the local Obama for America/Baldwin campaign office. It’s more than a nonissue. There’s no upside for the Republicans who talk about it. In early September, Thompson’s political director sent out an email with video of Baldwin dancing at a gay pride parade. “Clearly, there is no one better positioned to talk ‘heartland values’ than Tammy,” he wrote. Thompson promised to demote him. It’s not clear whether or not he actually did. Just as importantly, though, the Baldwin campaign blew off the story, letting Thompson get sucked into a media shame cycle. After President Obama finally admitted the obvious and announced his support for gay marriage, Democrats waited for the downside. It didn’t come. There was no notable dip in the president’s polling. There was, however, a spike in donations from gays who were holding out until the president “evolved.” This year, as in all of her re-elect years, Baldwin has collected checks from donors who see her as a rising gay star. The congresswoman’s 2000 opponent even ran ads that portrayed a woman, meant to look like Baldwin, hoarding money bags labeled “New York City” and “West Hollywood.” That would be hard to play in 2012, when millions of dollars worth of ads from outside groups like American Crossroads and the Emergency Committee for Israel are keeping Thompson in the game. And why even go there? In Madison, among the students, I hear the first subtle references to Baldwin’s sexual preference. A warm-up speaker says that electing her to the Senate will “make history.” Laura Gladstone, a grad student who’s signed up for extra canvassing, says it’s “super exciting” to have a hand in, possibly, electing the first gay senator.